For Part 2 of this review click here. But did it change everything? Does Shermer’s secular gospel really save us from absurdities and the atrocities they make possible? In 1981 Paul Fussell wrote his famous essay “Thank God for the Atom Bomb” in which he justified the annihilation of 100,000 civilians in Hiroshima as a straight up calculation to minimize sentient suffering. Shermer isn’t interested in thanking God for the atom bomb, but he certainly will thank science. A bargain? Yup, that sounds cold all right. 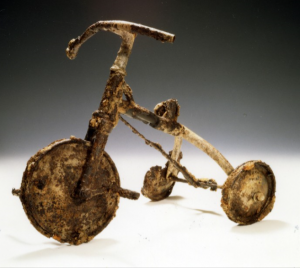 Charred remains of a tricycle from Hiroshima. In 1946 John Hersey published his bestselling book Hiroshima (New York: Knopf), a harrowing account of the bomb and its aftermath as told through the stories of six individuals. I have a valued first edition of the book and I thought we might be in a better place to consider Shermer’s moral reasoning if we considered Hiroshima from ground zero based on the reporting of Hiroshima. No doubt Michael Shermer assumes that he doesn’t believe any absurdities. He only believes in reason and evidence. 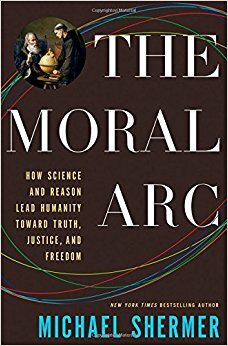 His secular gospel and its utilitarian ethic are, in his view, perfectly rational calculations speeding us toward the moral arc of history. 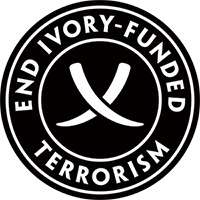 The religiously motivated torture and execution of suspected witches, he abhors. By contrast, the eradication of tens of thousands of civilians in the name of geopolitics and utilitarian ethics are perfectly reasonable steps on the long moral arc. The irony is that through it all Volatire’s dictum just may be vindicated. After all, Shermer’s view of reality strikes me as perfectly absurd.